In October, the Intergovernmental Panel on Climate Change (IPCC) released a report, Global Warming of 1.5 degrees C. Invited to provide guidance to the United Nations, this group of 91 scientists, authors and editors from 40 countries reviewed over six thousand scientific papers. Their many conclusions tell us that we have very little time to act. Many places on earth have already reached 2.7 degrees F (1.5 degrees C) of warming above pre-industrial levels. An overall global increase of 2.7 degrees could occur as early as 2040 with devastating consequences for the world. One area of impact is in human health. Heat and stagnant air, both created by climate change, increase the risk of ground level ozone, or smog. Increasing heat can also cause drought and wildfires, both of which produce particle pollution. Smoke from wildfires can impact people hundreds of miles away, for example, in one study, a forest fire in Quebec, Canada increased the particle pollution in Baltimore. Dust storms are happening now in Arizona, caused by drought, reduced vegetation and a lower water table. The report stated, with very high confidence, that, in the next 20 years, a wide range of health effects will occur because of climate change. Along with ozone and particle pollution, increasing amounts of allergens, mold and fungi will impact air quality indoors as well as outdoors. 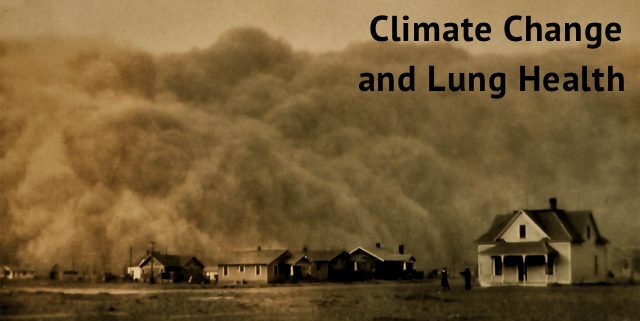 Extreme precipitation events, which are already happening, can increase the risk of waterborne disease outbreaks and increase asthma and upper respiratory tract symptoms. According to the American Lung Association, particle pollution can cause lung cancer . This type of pollution- from vehicles exhaust, coal-fired power plants and other industries as well as wildfires and dust – interferes with healthy growth and functioning of the lungs. This is why, the American Lung Association has started a Take Action for Healthy Air campaign to ensure that the Clean Air Act is not weakened and people become more aware of climate change and its impact on lung health. November is Lung Cancer Awareness month. This year, learn about climate change and what you can do to help save our air, our health and our planet. shame for all those who lie so much to the whole world.